Mexico is well known to me, in terms of piggy banks collecting, by the bracket on the back of most pig piggy banks. So one can hang up high the piggy bank to prevent anyone from taking the content away. The origin of the bracket is unknown to me. There are also nice sitting piggy banks of Mexican origin. The type of earthenware they are made of is called folk earthenware, and is in fact terracotta which is painted after the baking process (in a field oven?). Mexican piggy’s are either brownish or poly chrome colored. My number 940 in the collection was once red and blue. Why the paint is lacking is not clear. Age, buried, a permanently polishing owner? 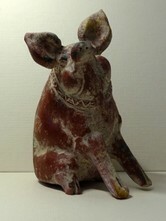 This, in my collection second, sitting Mexican piggy is 17 cm high.